At CES 2016, New Balance announced that it had an Android Wear device in the works that was supposed to launch before the end of the year. That never did happen, but we’re now at CES 2017 and they are co-announcing that product in deeper detail with Intel, plus we have specific pricing and launch info. The New Balance Android Wear watch is called RunIQ, will cost $299, and goes up for pre-order tomorrow before launching February 1. Yep, it’s here! 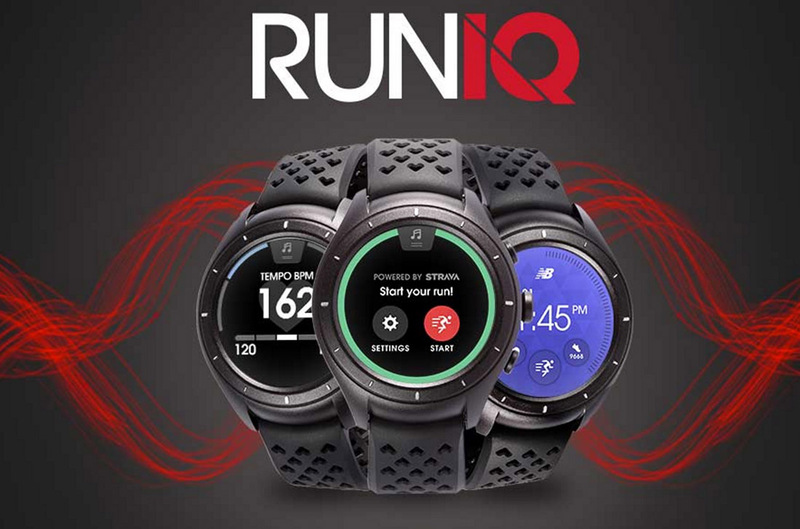 New Balance is hoping that the RunIQ will “help athletes take performance to the next level with the ability to run, track, and listen untethered.” They’ve packed it full of the goodies you want to get you to that next level as well, which means we have a 1.39″ round display, heart rate monitor, GPS, and 24-hour battery life or 5-hour battery life with continuous GPS running. The watch also features an Intel Atom processor Z34XX, 512MB RAM, and 4GB storage. Sync with STRAVA – Enables runners to connect and share workouts with a global community of athletes without a smartphone through built-in capability. Bring the Music – Sync, store and listen to playlists downloaded from Google Play Music. Map Every Workout – Track course, pace and distance with built-in GPS. Track Heart Rate – Monitor heart rate in real time and stay in the target zone. Keep the Pace – Track run time and intervals with a dedicated one-tap LAP button. Marathon Battery Life – 24 hours of battery life with typical use or up to 5 hours of continuous life with GPS and heart rate monitoring. Stay Connected – Get smartphone notifications and reply on-the-go when connected to a smartphone or Wi-Fi network. Again, if you’d like to pre-order, you can do so tomorrow at the link below.